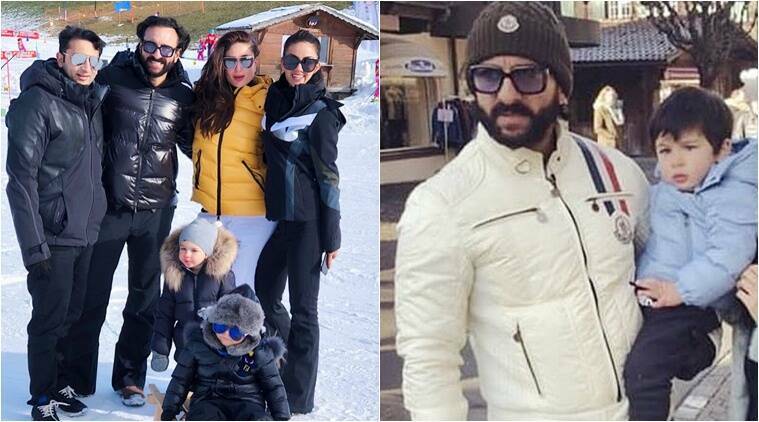 Taimur Ali Khan is in Switzerland with Saif Ali Khan and Kareena Kapoor to ring in New Year. Kareena Kapoor Khan and Saif Ali Khan are holidaying in Switzerland with their two-year-old son Taimur Ali Khan. Joining them is socialite Natasha Poonawalla and family. A photo of the two families from the ‘winter wonderland’ is shared on social media and like any other photo of Taimur, it has gone viral on the internet. In the photo, the youngest Pataudi, decked in his winter suit sits comfortably on the sledge while others strike a pose in the snow-capped mountains. Natasha Poonawalla posted the photo on her Instagram account with the caption, “Sledging with the little ones! Our winter wonderland ❤️❤️❤️.” Well, this is not the first photo of baby Tim from Switzerland. Earlier, the fan pages of the toddler shared his photo where he was in the arms of his father Saif. This is not the first time that the Pataudis are ringing in New Year in Switzerland. Keeping up with the tradition, last year too they took off to the picturesque land to welcome the New Year in style. Before leaving for Switzerland, Kareena and Saif celebrated Christmas with their family. While the two stars attended the traditional Kapoor’s Christmas lunch with Taimur, on Christmas eve they enjoyed a party with Saif’s children Ibrahim Ali Khan and Sara Ali Khan. However, this is not Taimur’s first overseas vacation in the month of December. The two-year-old rang in his second birthday in Cape Town with his parents. Unlike last year, this year, Taimur’s birthday celebration was an intimate affair. On the work front, Kareena has two films, Good News and Takht in the upcoming year. Saif is busy filming the second season of Netflix’s Sacred Games. 3 Anupam Kher on The Accidental Prime Minister controversy: Why should I screen it for anyone?